Let's Get Ready for Another Summer of Travel! With Spring here, most of us are ready for another season of traveling. Now is the time to carry out some basic maintenance on your motorhome to avoid problems later. Much of the suggestions in this article are drawn from the Fleetwood Maintenance Manual that we prepared in 2005. For a number of reasons, this manual did not receive wide distribution and we are looking at alternatives to making it available, as this article is being written. First, if your coach has not been driven over the winter, it is important to check all operating fluids to ensure they are up to the proper level and clean, ready to do their task. In addition to checking the oil and coolant levels in both the engine and generator, check the transmission fluid both cold and at operating temperatures. For those that have an Allison six-speed automatic with electronic controls, check the level using the control pad. Read your operating manual for the simple procedure - remember to get an accurate reading the transmission must be warm which may require a drive of some distance in cooler weather. It is a good idea to check the differential fluid, the hydraulic jack and slide mechanism fluid level (if equipped) and the front wheel bearing oil level (on diesel coaches). All of these fluids should be changed according to the manufacturer's maintenance schedule. Check the windshield washer fluid and the water level in the coach batteries as well as checking for corrosion of the terminals and retaining hardware. The brake fluid level on gas rigs should be checked and changed, if it is more than two years old. Replace all disposable batteries in CO and smoke detectors each year, and test all detectors for correct operation. It is good practice to check all drive belts for wear and/or cracking. On serpentine drive belts, some cracking of the ribs is acceptable, separations between ribs or any cracks that extend across ribs are unacceptable. Check the belt tension even if you have an automatic belt tensioner, it is possible for the spring in the tensioner to weaken and not keep the belt properly tensioned. Generally, you should not be able to turn the belt at the longest distance between pulleys more than 1/2 twist. Any more and it is time to replace the belt and possibly the belt tensioner. Start the engine and engage the engine driven air conditioner for a few minutes. This will allow the oil contained within system to circulate and keep the compressor and all internal components lubricated. It is wise to use this air conditioning system once a month, even if you use the roof air to cool your coach on he road, since the internal seals will dry out if not regularly lubricated. Check the holding tank dump valves for smooth operation and if sticky, spray a silicone spray on the chrome shaft and on the blade, if possible. If not, add a drain valve lubricant to your holding tanks for the first few times you use the coach. Sanitize the fresh water tank and check the water pump screen for any trapped debris. After adding water to the system, check the hot water heater for correct operation, on both gas and electricity. Make sure that there are no bird or pest nests in the water heater "chimney". While checking for blockages, check all furnace vents (including self installed coverings put on for the winter). Check, the refrigerator chimney to be sure it is also clear and the gas burner for debris, and ensure that when it is operating on gas there is a bright blue flame. Turn on the water flow to the icemaker and make a batch of ice, which should be discarded. Inspect all tires for proper air pressure, cuts or abrasions and tire date codes. 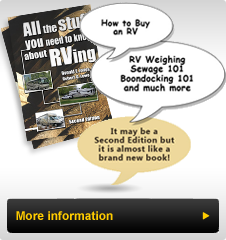 RV tires should be changed by the time they are six to seven years of age, regardless of tread wear. Depending on when the coach was built it is possible that a coach five yearsold could be due for tire replacement. Inspect the roof and all caulking to ensure that there is no damage, bubbling of the surface or voids. If you find any, then have the roof repaired or caulking replaced with the appropriate lap sealer for the roof material on your coach. Many RVers neglect the towing system; some do not know that tow bars require routine maintenance. Contact your maker for what is required and do it now (see TechTip #45). Inspect safety cables and the electric harness for damage and either repair or replace it before setting out for that first trip. Since checking the tow system includes ensuring that all lights work on the Toad, check all lights on the coach for proper operation. This includes side marker and roof cap clearance lights, together with signal, brake, parking, fog and headlights. If you have a Toad braking system (highly recommended) check its electrical or other connections, activating cables (if applicable) and the break away system. Now that all systems are checked out, take that first drive, acknowledging that you could be a little "rusty" so take time to become reacquainted with your coach. Enjoy safe travels this year.